I had to do some researching the other day on the Centennial Terminal, also known as Terminal 2 of NAIA. I had to send off some family friends there and I am only familiar with The Domestic Terminal and NAIA Terminal 1. I read up on Wikipedia about Ninoy Aquino International Airport before going there and asked some directions from friends. Here are my 10 personal discoveries. 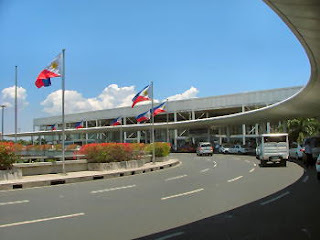 Terminal 2 is home to Philippine Airlines and Air Philippines, its sister company. It looks like NAIA Terminal 1, only better. It seems less crowded since other airlines are not bunched up here. The parking lot is cleaner. The restrooms are more presentable. There's a building that appears to ba a control tower right in the middle of the parking lot. Departures are on the upper level while arrivals are at ground level. There's a Figaro coffee shop at the North Wing near international arrivals. 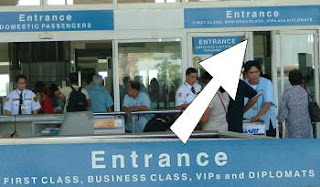 There's a separate entrance for 1st class, business class, diplomats and VIP. I wonder when I'll be any of those any time soon. Getting to this airport means having to go through traffic caused by both domestic and international terminals. Because of No. 9, get there as early as possible to avoid panicking car passengers who keep on checking their watch in fear they may miss their flight. (I blame C5 traffic due to the elevated flyover construction). No wonder that triangular block seems so straight.